You know those big dinner salads you can get at some restaurants? The greens cover a platter, and there are a variety of toppings, and at least two condiment containers for the dressing. You can eat and eat and eat and eat. Your dinner companions can finish their entree as you just keep eating, with little apparent progress on your meal. Using fabric stash is like that, with the added problem of the server coming ’round and putting more salad on your plate now and then. Some people measure stash in and stash used over a period of time, a calculation that is not interesting to me. Since all my fabric collection is in a fairly small space, it’s easy to see when it’s increased or decreased. Most years in October, I do a “state of the stash” post to review it. This year I didn’t, but the text of the post would be similar: It changed! I have a bit more! or a bit less! As I look at this quickly-passing year, I do notice how my stash has changed. It is a bit smaller than a year ago, and I didn’t buy a huge amount this year. As always, most of my projects relied heavily on stash rather than new purchases. And as always, my favorite fabric purchases are those I used right away. I did buy mostly new for two projects. Georgia’s graduation quilt is from white and light grey, at her request. 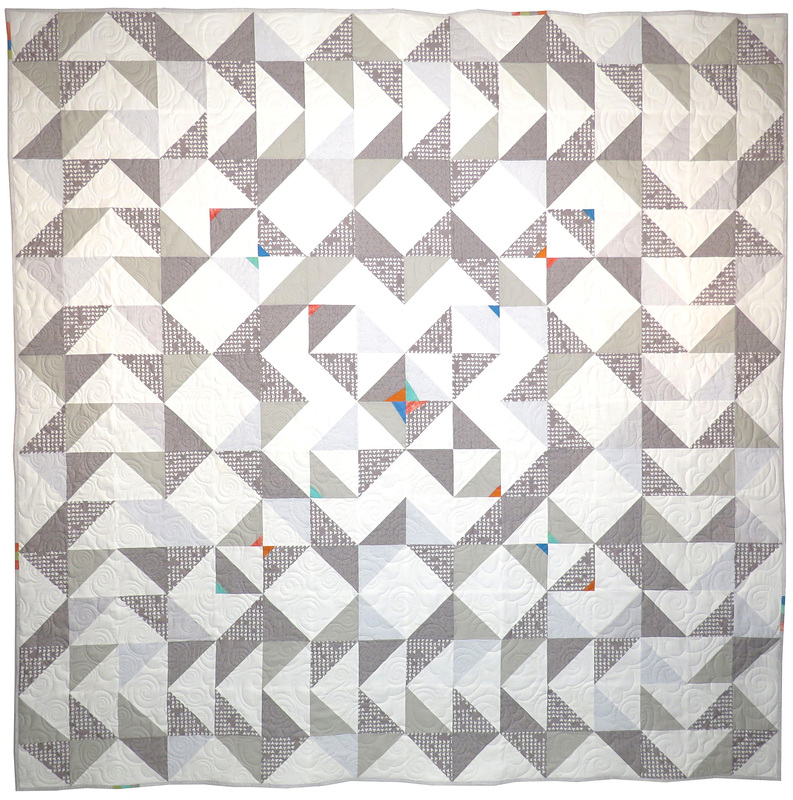 I rarely use grey, and white is not typical, either, so this was a rather hard quilt to make. I don’t remember the size, but it covers her queen-sized bed nicely, so something like 96″ square. Georgia’s graduation quilt. Queen-bed sized. May 2018. Photo by Jim Ruebush. Almost all of the grey got used up in Georgia’s quilt. The leftover greys became the back of Heather’s baby quilt. Leftover white went on the front. back of Heather’s baby quilt. Photo by Jim Ruebush. Front of Heather’s baby quilt. October 2018. Photo by Jim Ruebush. 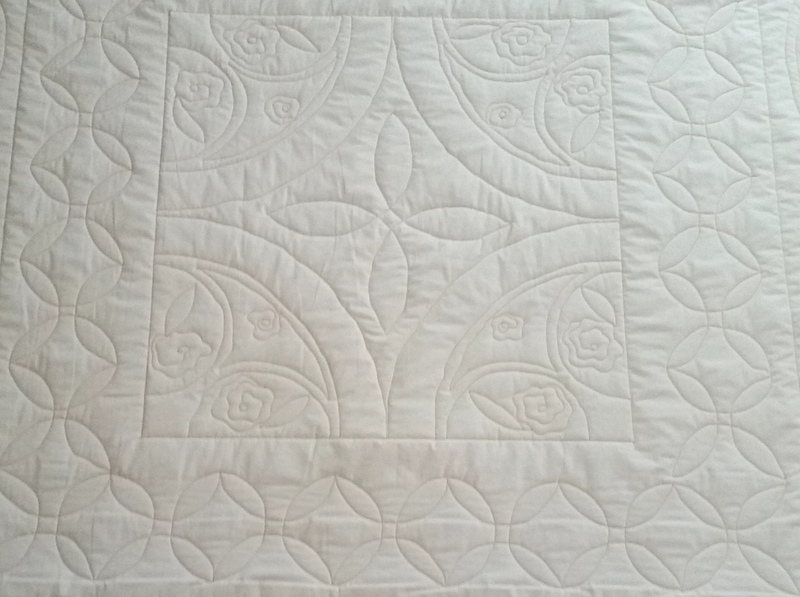 Another project that required new fabric was the wedding quilt for Son and his bride. 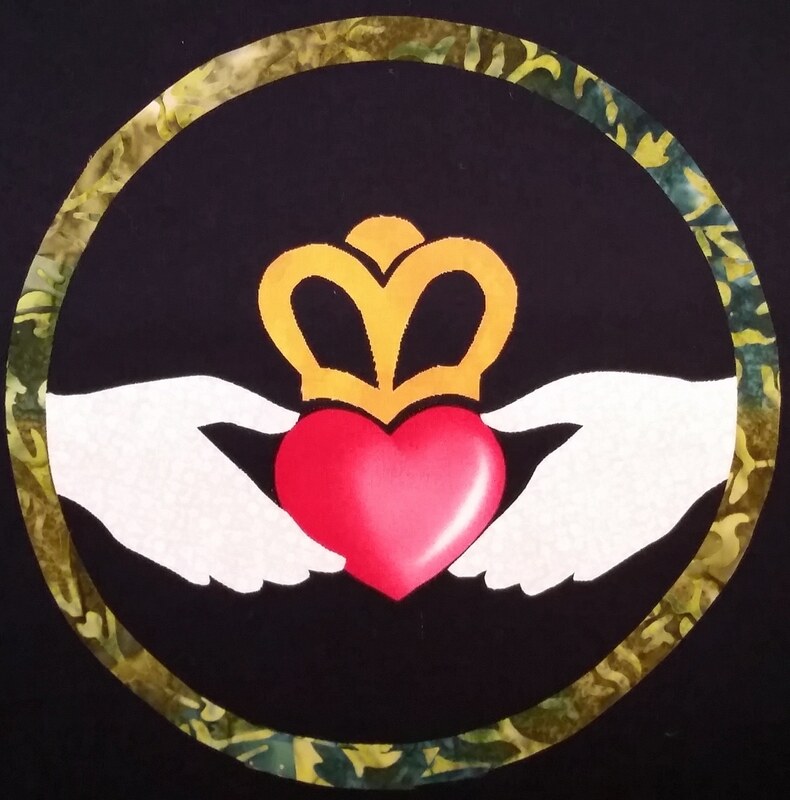 To make Hands and Hearts, I needed to buy solid black Kona for the background, and a variety of batiks for the hands. 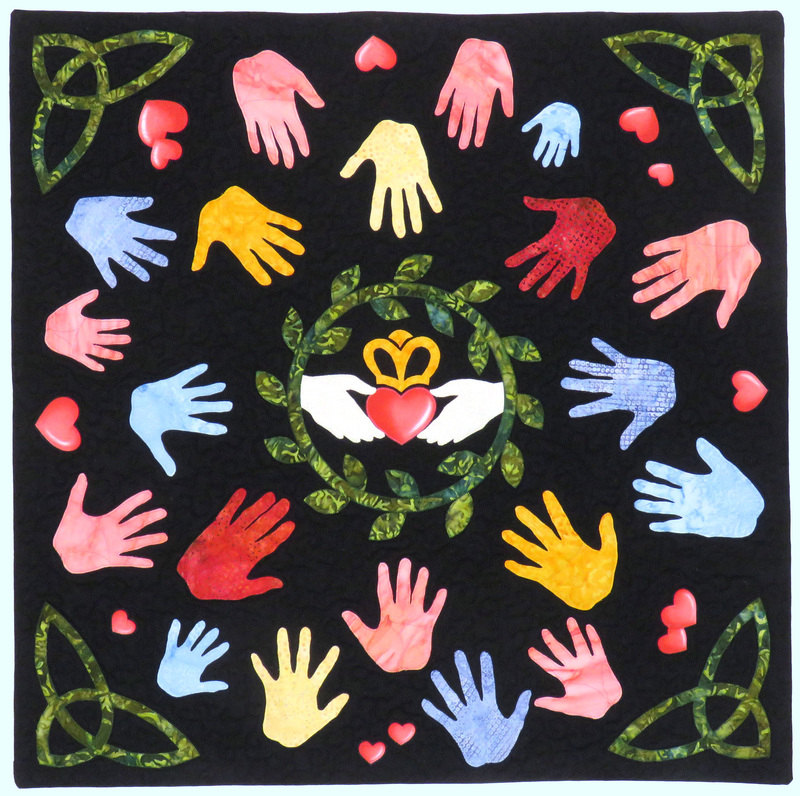 The green batik in the wreath and corner Celtic knots was from stash, as were the components in the Claddagh ring and the fussy-cut hearts. The hearts actually came from something purchased in 2007, so it’s one of the older pieces in my cupboard. It would be hard to pick a specific favorite fabric from 2018. Since I don’t think of myself as a fabric collector, the best fabrics are those that are most useful. Sometimes that means they’re quite ordinary. Solid white, solid black, pastel batiks, grey and white prints. None of these are exciting, but the quilts they made were gifts of love. This entry was posted in Quilting and tagged #31dayblogchallenge2018, #myyearinquilts, Baby quilts, fabric, family, Friends, Gifts, Graduation quilt, Stash, Wedding quilts on December 2, 2018 by Melanie McNeil. When I returned home from a high school reunion, Jim informed me that brother-in-law Dan was granted an “honor flight.” According to the website, “Honor Flight Network is a non-profit organization created solely to honor America’s veterans for all their sacrifices. We transport our heroes to Washington, D.C. to visit and reflect at their memorials.” Dan’s trip to DC was scheduled for less than two weeks later. I wanted to make him a quilt. Coincidentally, another brother-in-law, Sonny, was also taking a flight in mid-October. One quilt wouldn’t do; I would make two of them. 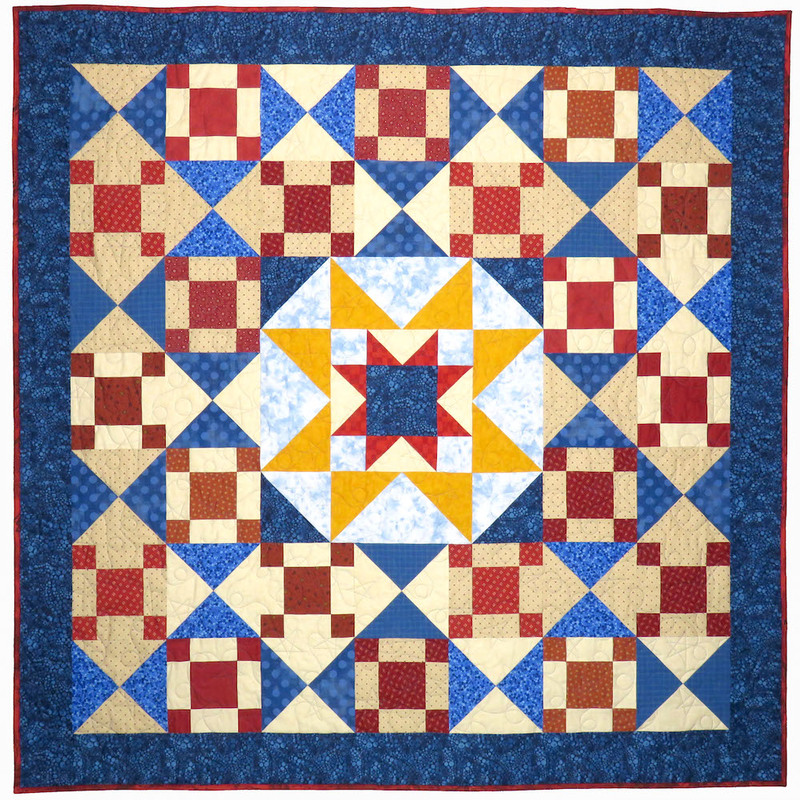 When I need to make a quilt in a hurry, I often design it using Electric Quilt software. Currently I’m using EQ8 (version 8.) I designed similar quilts for both men. The medallion format with which I’m so familiar uses block “borders” for these, making sizing simple. Dan’s Honor Quilt. September 2018. About 66″ square. Photo by Jim Ruebush. Border blocks (hourglasses and puss-in-the-corner) finish at 8″. Sonny’s Honor Quilt. October 2019. About 61″ square. Photo by Jim Ruebush. Border blocks (rail fences) finish at 6″. Both quilts were easy to execute, but Sonny’s was actually much simpler. It uses all one block style, alternating blue and red, and solid white as the only background fabric. 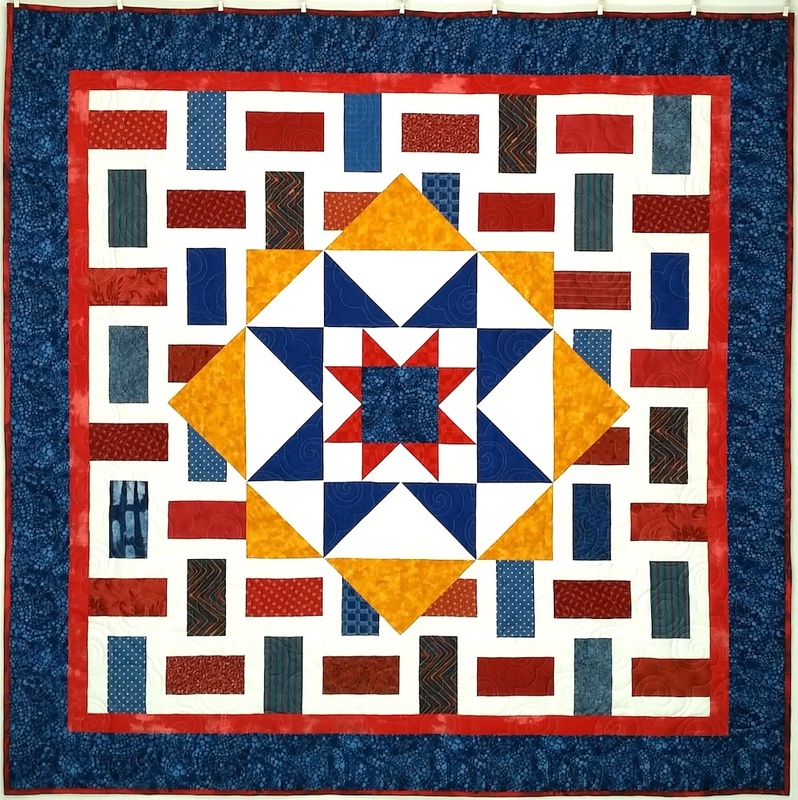 The only complexity in Sonny’s quilt, in terms of the block borders, is the blocks combining half-square triangles and rail fences. It took a bit for me to work it out, but in truth it was really easy to do. If I ever make them again, I’ll show you how. I used all stash for both quilts, except borders and backs. Both used lots of smaller pieces for the blues and reds. In the midst of making these, I realized my sweet neighbor Heather’s baby shower was in early October. I planned to make a quilt for the baby, but he isn’t due until December, so I wasn’t in a hurry. With the shower coming up, that changed things! I used the same rail fence blocks that were so quick for Sonny’s quilt. Once the front was finished, I gleaned leftover parts from another project to make the back, turning the quilt into a two-sided quilt. All fabric was from stash. Heather’s baby quilt, front. October 2018. About 46″ square. Photo by Jim Ruebush. Heather’s baby quilt, back. October 2018. Photo by Jim Ruebush. The fourth quilt was a hostess gift. Jim and I went to Peru! (We’ll write about our trip soon, on Our View From Iowa.) One of the meals during our tour was at a family home. The tour company recommends bringing a small gift for the hostess. It’s a way to connect with the family, as well as show gratitude and have a way to say something about your own home. My original plan was to take a small wall-hanging that’s already finished, but it wouldn’t fit nicely in our carry-on suitcases. Instead I started a new one, with the primary design being a map of Iowa. The fabrics chosen represented the corn and soybeans grown here, as well as the broad blue skies. 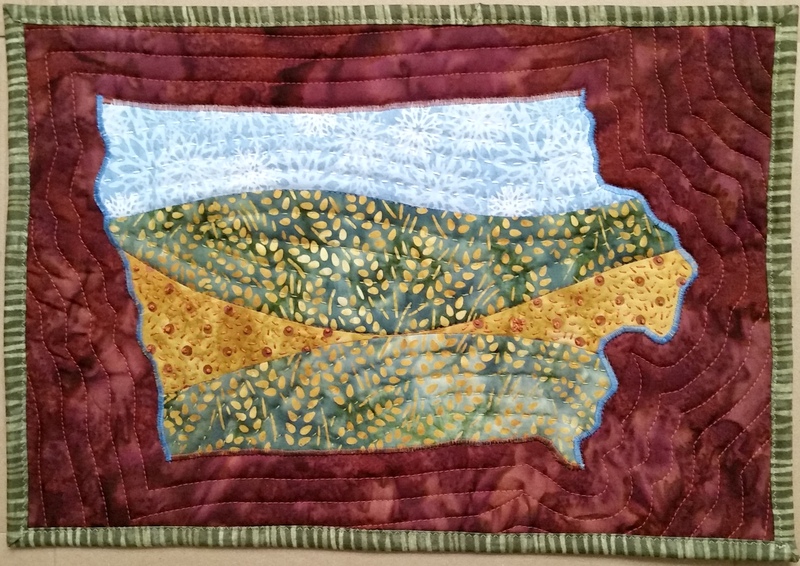 Using a quickly-traced outline of Iowa, I cut the assembled cloth to size and appliquéd it to a background fabric. On the left (west) and right (east) sides of the map, the blue stitching represents the Missouri and Mississippi Rivers. Hand-stitching through the map, and machine-quilting through the background, completed the design. On the back I adhered a label, written in Spanish, to explain what the image is and how it represents Iowa. Un Mapa de Iowa. October 2018. 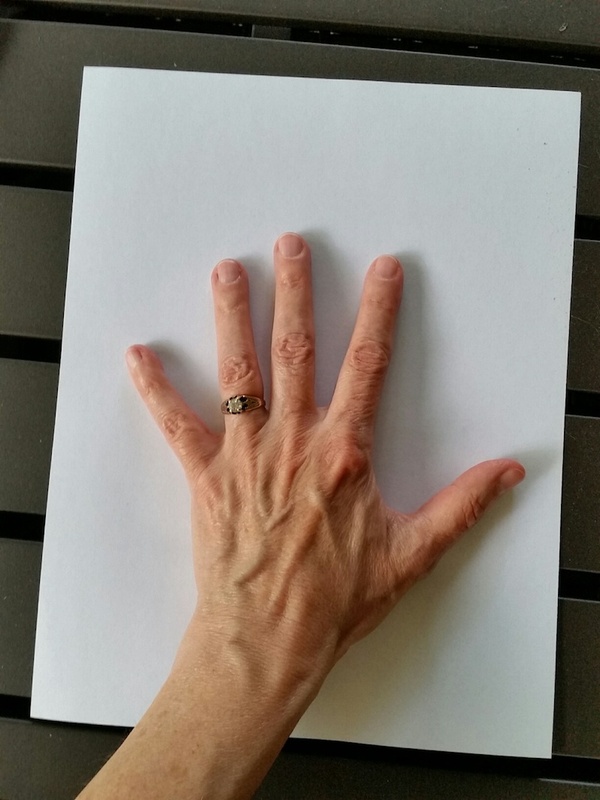 About 15″ wide. Last but not least, I also put a binding on a VA hospital quilt, which was finished except for that. It will be donated at my next guild meeting. No photo of the finished quilt. It was a busy month for quilting, and as you may or may not have noticed, I didn’t write here at all during that time. 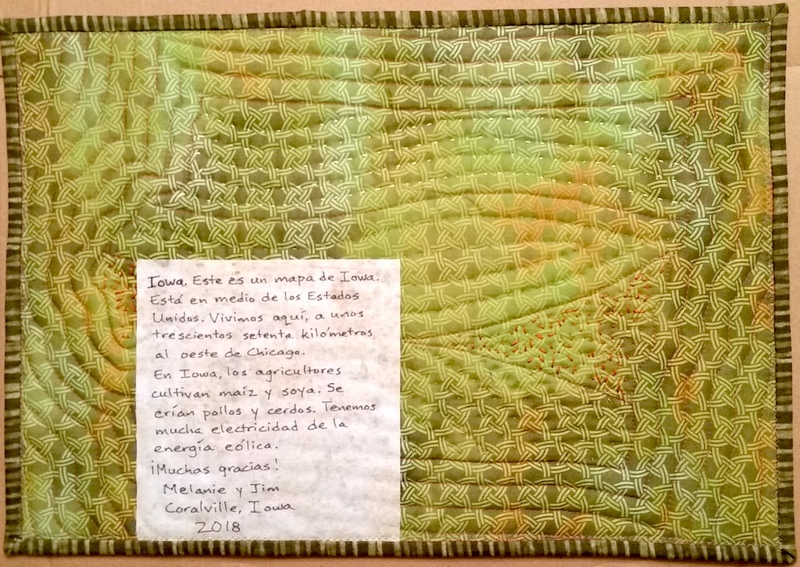 As soon as the Iowa map quilt was finished, we left for Peru, giving another two week gap. One thing to note is, the longer I go without writing, the harder it is to get started again. Hopefully this will break the ice and I can shift into semi-regular posts again. This entry was posted in Creativity, Quilting and tagged Baby quilts, Busy, family, Friends, Honor flight, Honor flight quilts, Iowa map quilt, Iowa quilt, Stash, Using stash, VA hospital quilt on October 31, 2018 by Melanie McNeil. It’s been a while since I’ve written, and I’ve missed reading a lot of your posts, too. But here I am, finally with a day unscheduled and more flexible. In some ways I feel like I’m finally coming up for air. Whew! 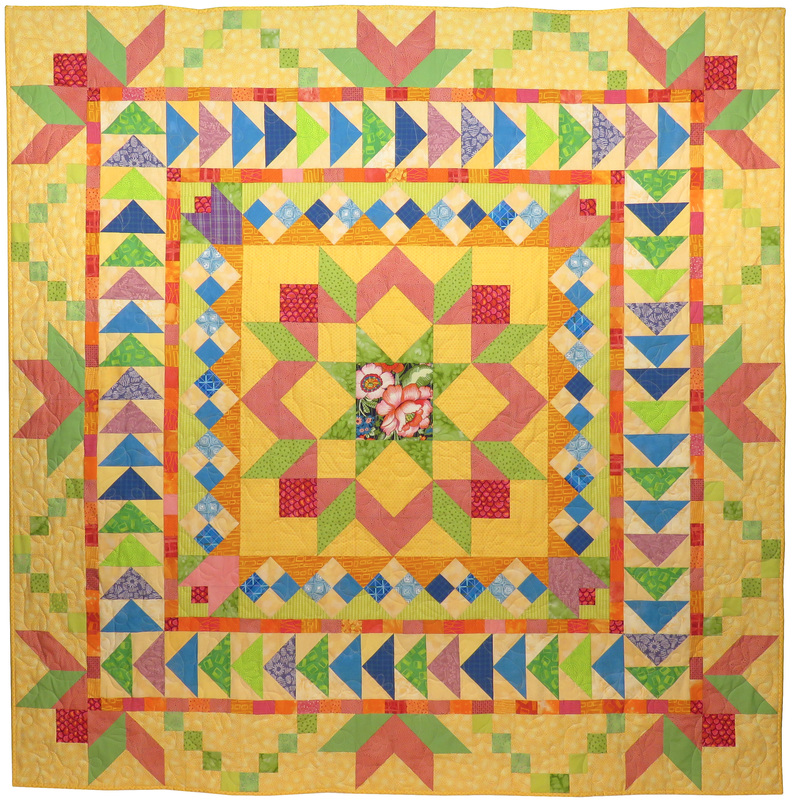 Today I’ll start with Kim’s Bright Garden, a quilt finished on March 31 and opened Monday by Kim, aka Son’s girlfriend. I started this project late last year after imagining a border built from variable stars on point. The imagined border had a pale yellow background for the blocks, with blue or lavender setting triangles. The star centers would be pieced, and centers and points would be from chalky pastels. The feeling would be floral, though without actual flowers or floral fabric. However, after I made 16 star centers and cut much of the rest, I felt unfocused and uncertain. 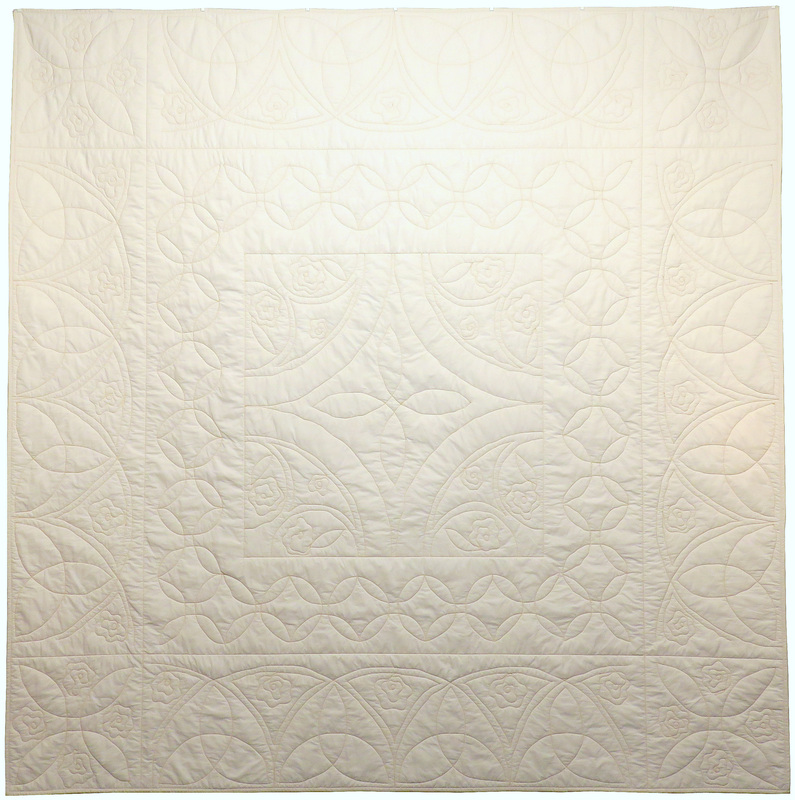 As it turns out, it’s often wiser to begin a medallion quilt with a medallion or central motif. The center creates context and direction for what comes after. After that rough start, I refocused by choosing a center block design and fabrics. I chose first borders and middle borders. After extensive puzzling, I designed and made the final borders. In March I quilted it and bound it. The binding is the same saturated yellow as in the center block. Part of my busyness lately has been projects for guild. In the last few months I quilted 10 projects, two of which I did early this year. Each has required more prep work than I anticipated, so I’m putting more of these on hold for now. Besides that I’m on the program committee, the guild’s group that sets up speakers and presentations for upcoming meetings. Currently we’re working on the 2018-19 year. It’s a big responsibility, as programs is where the majority of the annual budget goes, and we want to make sure members get their money’s worth. I’m newish on the committee and still learning the ropes. Fortunately, it’s a good group and I’m learning a lot. We have a quilt show in early June, and I’m working on a couple of parts of the planning. The big contribution I hope to make is with a Powerpoint slideshow outlining the value of a quilt. Our show is held on the same weekend as the local (big, regional, juried) art fair, and many people attending won’t have quilting backgrounds. 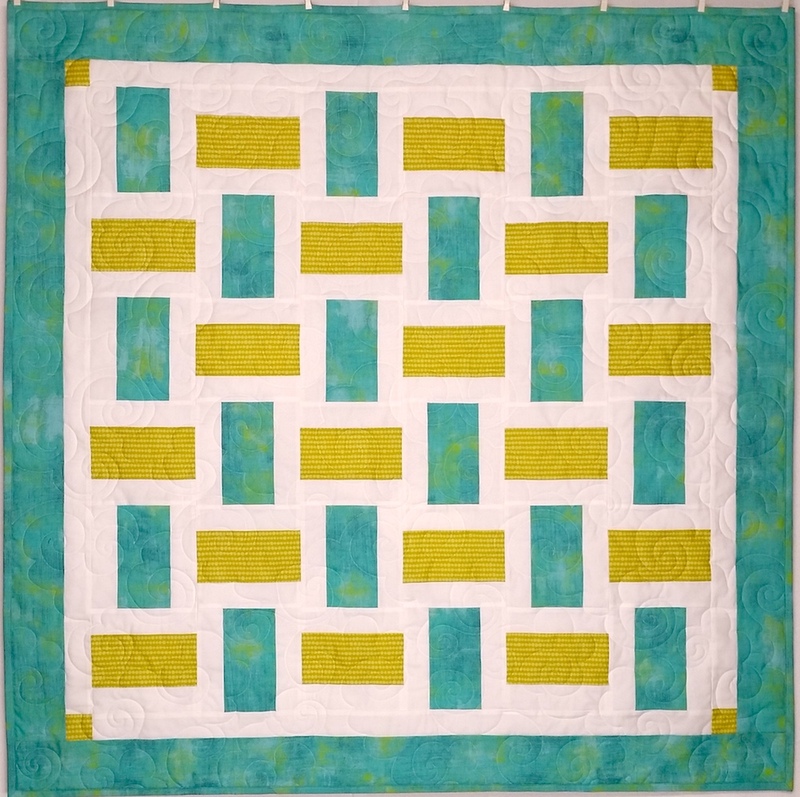 If my slideshow can explain what makes a quilt special, by the process and the value of time and materials, it might add to attendees’ appreciation of the quilts they see. And it might increase the bids they are willing to make on our silent auction offerings. Besides the efforts for the benefit of the show, I’ve also worked on two quilts to enter. (It is non-judged, simply an exhibit to share the beauty of our work with others.) We’re having a special “red and white” exhibit and I’ve made two quilt tops for entry. Both still need to be quilted, bound, and labeled before our show. More to come in the next few days, as I get back in the swing of writing some. Good to be here again! If you’re still reading, thanks so much! 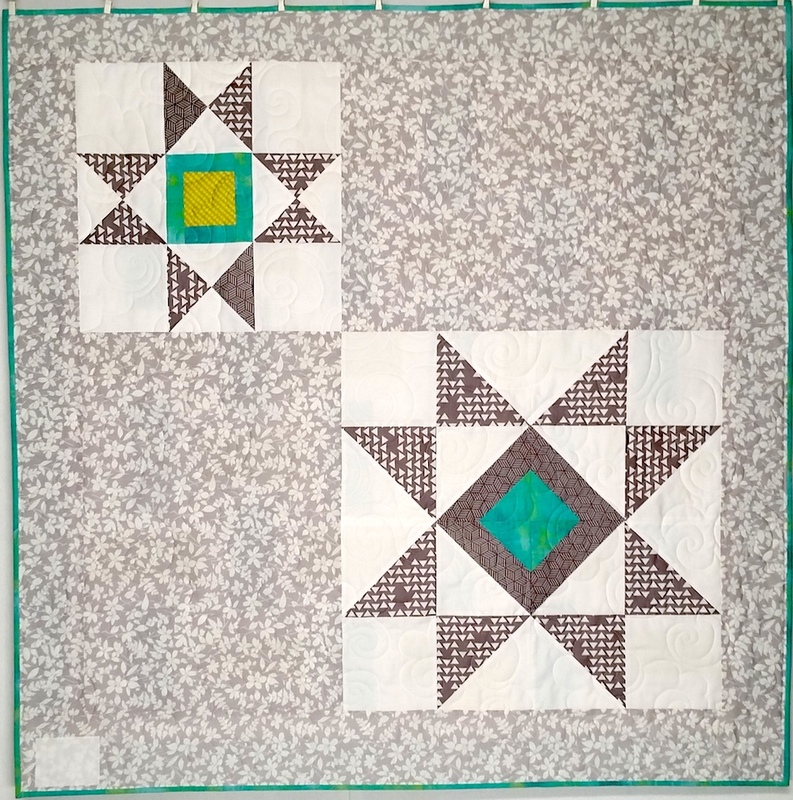 This entry was posted in Medallion Lessons, Medallion Quilts, Quilting and tagged Design-As-You-Go, family, Medallion Lessons, Medallion quilts, Process, Progress on April 14, 2017 by Melanie McNeil.